A useful food at any time, parsley is rich in a number of readily absorbable nutrients, including vitamin C and phytoestrogens, making it a valuable supplement, particularly during menopause. Medicinally, the root is preferred, having a distinct benefit on the urinary tract and in rheumatic problems. 2–4ml a day, or max. 30ml (1 oz) per week of a 1:3 tincture. As a tea, it has a mild flavor. The tea can be made either from the dried herb (1 tsp per cup of water) or a tea can be made from the fresh herb using 1 tablespoon of chopped herb per cup of water. The most familiar employment of the leaves in their fresh state is, of course, finely-chopped, as a flavouring to sauces, soups, stuffings, rissoles, minces, etc., and also sprinkled over vegetables or salads. Parsley has strong deodorizing properties and the leaf is commonly chewed to treat bad breath and to freshen the breath. It is said to mask the odor of garlic on the breath. The seeds can be used for the extraction of an oil called Apiol, which is of considerable curative value. The best kind of seed for medicinal purposes is that obtained from the Triple Moss curled variety. Take 5 to 15 drops in capsule. 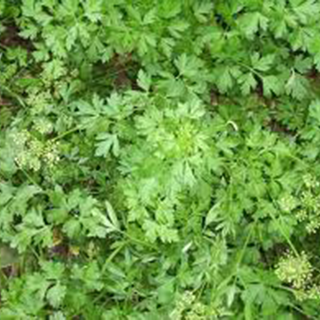 Parsley is propagated from seed, which can be a challenge. Parsley seeds are small and the shell casings are hard. They are notoriously difficult to germinate. Start the seeds indoors a few weeks before the last frost in your area as they take some time to get going. Parsley seeds like warm soil, so give their pot a warm spot (not hot) if you want to speed up the process a little. The roots are collected for medicinal purposes in the secondyear, in autumn or late summer, when the plant has flowered.